The Fireball puzzle is a contest which goes through Monday. We will have a review once the contest is over. We have a pronunciation change theme in which consonant blends ending in R (dr, thr, tr, and br) become their own syllables with the inclusion of schwa sound (roughly). 16a [Part of a blackmailer’s outfit?] DURESS SHIRT. Dress… This one was the last to fall for me, maybe because the added sound is different (to my ear) than the others. I pronounce “duress” with a long u (though I’ve heard it the other way many times). 26a [Grove by Walden Pond?] THOREAU SHADE. Throw… Nice one. 57a [Summer venue for studying Bach and Handel?] 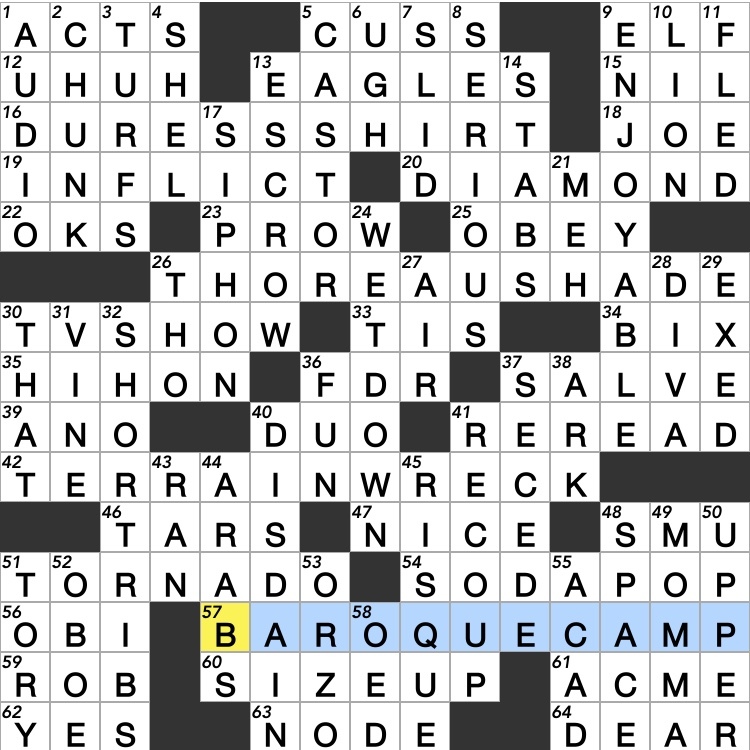 BAROQUE CAMP. Broke… It’s true they come up with all kinds of summer camps for kids these days, but I don’t know if this one would get many attendees. Just sayin’. I like the variety in using different consonant blends, and there’s definitely some humor in there. Even though I’m sure this type of theme’s been done before (maybe many times), if the puzzle is clean and ENJOYABLE, I’m happy to give it a thumbs-up. 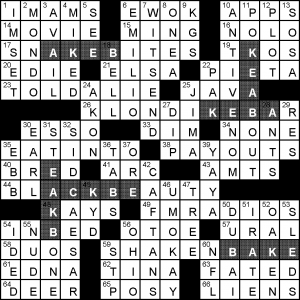 I started off badly by putting RANT at 5a [Churn out cross words]. This led to ACK at 6d [“Eww!”] and even a consideration of TEDIOUS at 8d [Grave]. Consequently, my whole NW was a mess until I returned to it at the end, realized 5a was the CUSS word, and was able to move on. RISQUE crossing BAROQUE makes nice use of the Q. I also liked the friendly “HI, HON!” as well as TORNADO and SODA POP even though I don’t know anyone who uses that whole phrase. SIPHON is not a word that appears very often, and to me it both looks and sound like the name of a Greek god. The god of gasoline theft, perhaps? One clue of note: [Whirled power?] for TORNADO is a pun on “world power.” I just got that. Solid wordplay and fill. 3.6 stars. I leave you with MOMMA [Comic strip whose title character was Sonya Hobbs] by Mell Lazarus. Be sure to check out this touching article about how the final one-panel strip came to pass. Oh, and good luck to all ACPT combatants! I didn’t know who DR ROMANO is (ER was before I was a TV-watcher), but I did somehow recall that Natalie Portman is ISRAELI. Go figure! In anticipation of the ACPT this weekend, Brendan has given us another crack at his excellent, brain-busting 19×19 puzzle from the 2013 ACPT, titled “Say What?”. Rather than review this puzzle again, I’ll just link you to Matt’s Fiend review of this puzzle from 2014, which I think holds up quite nicely. In addition, Brendan has posted a short Q&A with reigning ACPT champion Erik Agard, which is most certainly worth your time. At the 2013 ACPT, this puzzle took me 12-13 minutes (out of an allotted 30 minutes). Solving at home five years later, on the computer, having solved this puzzle before, it took me a little less than 5 minutes. As a point of reference, Dan Feyer solved it in 5-6 minutes, on paper, the first time he saw it. So… he’s pretty good. I hope to see many of you in Stamford this weekend (if you see me, please come say hello! ), and I’ll see the rest of you back here next week! [*Hazards for herpetologists], SNAKEBITES. Yes, but even more so for wannabe amateur snake-catchers with drinking problems. You should see one local’s arm after messing with a puff adder! [Didn’t emulate Washington? ], TOLDALIE. Story is apocryphal at best. [North-of-the-border gas], ESSO. Survey by our Fiendly leader suggests this is not all that common even there these days. This entry was posted in Daily Puzzles and tagged Brendan Emmett Quigley, Christopher Adams, David Alfred Bywaters, Ed Sessa. Bookmark the permalink. 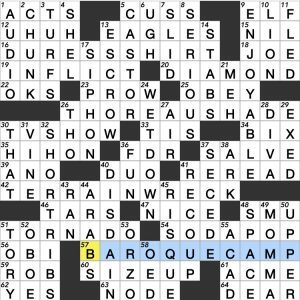 …and where’s the solve/review crosswordfiend? 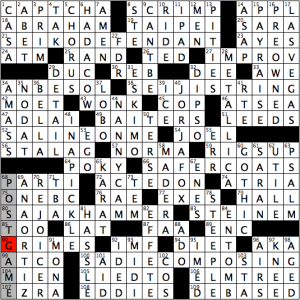 I enjoyed the puzzles I worked today – NYT, WSJ, UC. One clue felt off to me. WSJ 32D – Barbecue joint order for SHORTRIBS. I’ve eaten in a lot of barbecue joints. I’ve also eaten a lot of short ribs. I’ve never eaten short ribs in a barbecue joint. Maybe it’s a Texas thing. Or maybe a Korean BBQ restaurant is a joint. My husband, who is somewhat of an expert when it comes to eating ribs, says that here in Virginia, a lot of barbecue joints smoke ribs, also. Ribs I get. Spareribs, baby back ribs. But short ribs? I’ve usually braised short ribs. I have also grilled them like a steak. They were good, but very fatty. Ah, I get it. I am not familiar with short ribs, then. The ones that I have sat across the table from were small, connected items with barbecue sauce. I googled them, and Wikipedia says that they can be barbecued but are more often braised, stewed, or cooked sous-vide (not sure, didn’t google that). Also they come from a cow. Thanks – I like learning things! Yes, they are beef. That’s why I thought it might be a Texas thing. They barbecue a lot of beef in Texas. I love barbecued brisket. Sous-vide involves sealing the meat in a plastic bag and submersing the bag in water. Next you heat the water to the desired temperature and leave the meat in long enough to bring it to temperature. Then you can remove the meat and sear the outside. The benefit is that the entire cut of meat reaches the same temperature where traditional grilling results in the outer portion being significantly hotter than the interior. I really liked the NYT. The grid looks like a little person. Not relevant, exactly, but still fun. Good luck to all you ACPT competitors! The Cruciverb website appears to be down at this time. Been looking out for news regarding Cruciverb’s day-long disappearance. Glad to find I’m not a lone sufferer of cruciverbal withdrawal this first day of spring. WSJ: Jim, thanks so much for providing that link regarding the end of Momma. It was a lovely story to read. What a lovely tribute to Mr. Lazarus from all his peers.